After my account was set up, I just had to enter the browser address into the OnCourse Web Content tool and labeled the link ForAllBadges. Then my students just had to click the link to access that site within my class site. I added each student as a participant by entering their email address and a default password. One of my doc students, Rebecca Itow, helped me to create these badges (Rebecca's experience in P2PU's Badge Maker course was a great help in this process). In order to create badges, we first needed images. We used a shareware program called InkScape (a tool introduced to us in the P2PU course) to create the images for each badge. Given the nature of the badges and the class, we did not worry too much about aesthetics. 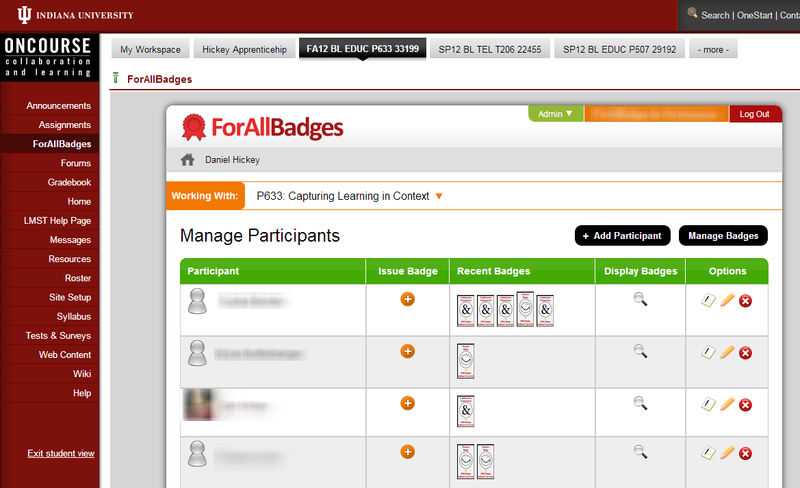 Once the images are created, we just had to click on Manage Badges and then Add Badges to create the badge. We only used the Name and Description fields. We left the Criteria field blank so it could be filled in when the badge was actually awarded. You can see that we could have included a lot of information by using the other fields. What makes ForAllBadges “OBI-compliant” is that these fields are consistent with the metadata structure that the Mozilla Foundation’s Open Badges project defined in 2012 as part of the MacArthur Foundations Badges for Lifelong Learning initiative. Once the participants were added and the badges were created it just took a couple of clicks to issue a badge. Because of the way I set up the badge, I entered the actual criterion when I issued each badge. This was simply an explanation of why I awarded that badge to the specific student. 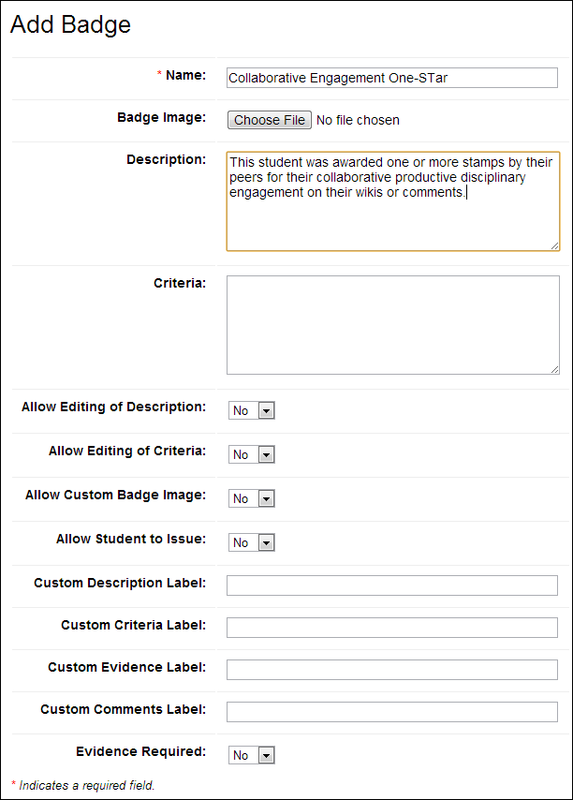 The students can easily see which badges each of them has been issued, and can click on any badge to see the criterion upon which it was awarded. 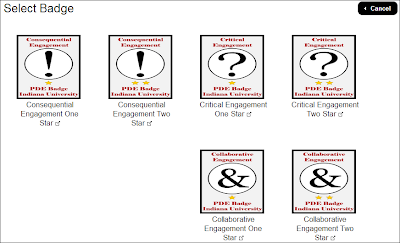 I have been playing around some with the wording of the criteria each time I award a badge. This is a nice example why digital badges have such transformative potential. Because I knew this badge might be “pushed” out beyond my class, I was forced to think about the information that the badge would contain. 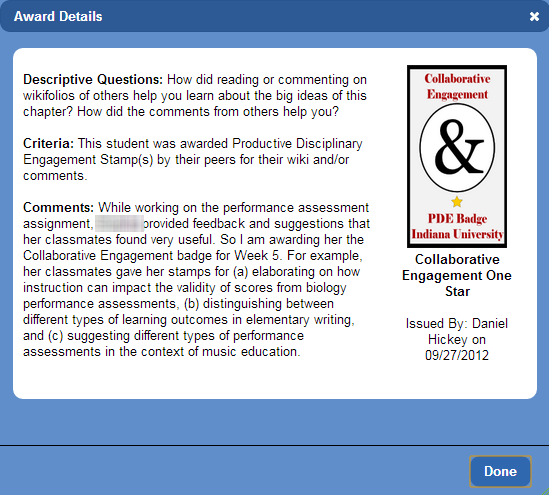 And while I had decided to not make badges part of the course grade, I certainly hoped that students would value them. Particularly because every student could inspect every badge that I awarded, it was important that the criterion be credible at least in the context of the class. 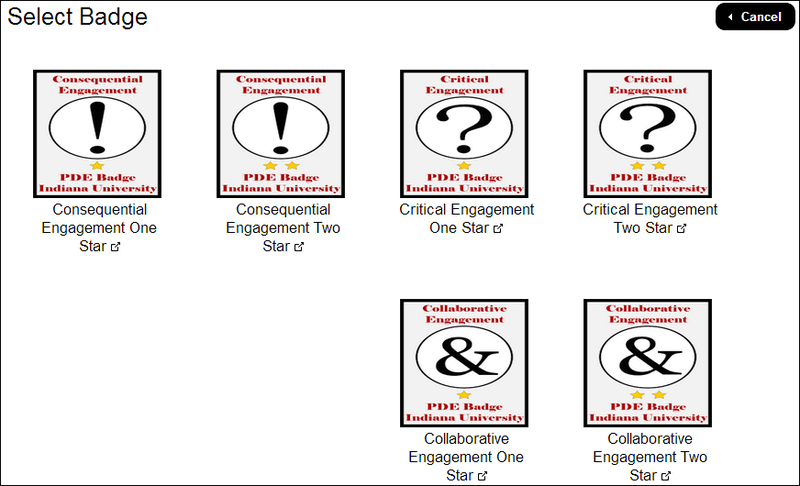 I still have some work to do to make the badges credible beyond the context of my class. When I first issued badges, I included links back to the comments from classmates that led me to award the badge. Those links would work for the students who were enrolled in my class and only then while they were inside my OnCourse site. While those links supported credibility within the class, they were rather unwieldy. More importantly, a dead link would undermine the credibility of a given badge when viewed outside of the class context. So I removed the links. I will write more about credibility in the future, but for now check out Carla Caslilli’s excellent post about credibility and validity for digital badges. In addition to credibility, I had to think about privacy. When I removed the links, I initially left in the first names of the awardees classmates whose comments led me to award the badge. But I realized that if the badge was viewed outside of the class context, that some students might object to being identified. Even though it was just the first name, I suspect that putting such identifying information might violate FERPA rules that strictly protect the privacy of anyone enrolled in a public school classroom. The example above shows the badge I eventually awarded. I left only the awardee's first name in the badge (it is obscured in the picture). But I provided enough detail so that the students in my class could recognize whose endorsements I was referring to. If this is not clear or not helpful, or if you have comments, please let me know! Now go forth and play! This is great! It's exciting to see others creating badge systems and thinking about everything involved in creating and issuing badges. 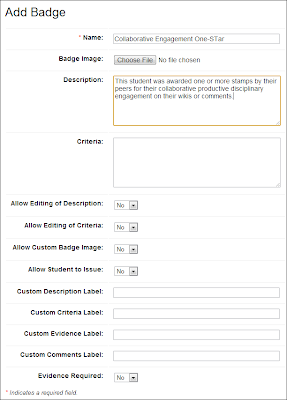 That's really neat that you were able to integrate ForAllBadges with your university CMS--I didn't know that was possible, but it seems like a great option for awarding badges within a university classroom setting. I'm also working on a badge project (test badge here: edbadges.blogspot.com, process documented here: http://bit.ly/Om0Hjo), and I've been experimenting with badg.us, which seems to be a good option for offering a lot of badges at once. It is also good if you want to display your badge outside the classroom setting, so anyone can see it and potentially earn it. I like the issue you bring up here--of making badges meaningful so students will WANT to display them. The badges I'm making are targeted at 8th graders, and for them the badge visual is key to its desirability. But with university students desirability may have more to do with how compactly the badge displays a skill they may want to show to others, like maybe a potential employer. I don't know though--there are a lot of questions with all this, considering that badges are relatively new. I'd be interested to hear more of your thoughts on credibility and meaningfulness. That is great. Did you get that cool sense that when you defined a badge AND you thought about somebody pushing it out to Facebook that you realized it really does matter what kind of evidence that we put in the badges we issue? It was astonishing to me how the validity/credibility issue loomed so largely, and how much it pushed back on my teaching. BTW, while we have ForAllBadges plugged in to OnCoruse, the students can all access the site directly from the web at the ForAllBadges website. It is still password protected so we are still FERPA compliant. But from either place (in OnCoruse or on the web) the earner can push it out to their backpack and then from there they can make them public if they so choose. Yes--your point here about validity is absolutely key to the entire badges concept. Without providing (1) the criteria for earning the badge and (2) the evidence that the badge earner has met those criteria, the badge loses its greatest potential value. I think that as we see badges becoming bigger and more accepted as a method of crediting skills and learning we will see certain badges beginning to take on a credibility just through their popularity. It may happen taht these trending, viral, or big-name badges will be most sought after for the name or the reputation of the individual/organization offering them. But it all goes back to this idea of criteria and evidence which create validity and credibility in the beginning. It's really interesting stuff! And I think it's important stuff, too. Badges definitely have a lot to offer to 21st century learners. Facinating info! I can surely see such a use of digital badges used (e.g., via iphone or ipad) during professional meetings (besides classroosm), where folks (audience) provide badges for excellent research papers and insightful, innovative interpretations of texts. This info. could also be used by program committees evaluating program units. Thanks, yes on both points. I will break out my reply into two. Badges are indeed being widely taken up in professional meetings. Getting a digital badge for "best paper" or for the various awards we give seems like a natural way to let recipients broadcast their accomplishment without worrying about appearing self-aggrandizing. If they push their OBI-compliant badge out to facebook and twitter, their their friends and followers can click on it the badge themselves and see the criteria that someone else posted, and ideally click on the link to see the paper. I have never won a best paper award but if I did I might or might not tweet it or post it to facebook. But I sure would not include the criteria (e.g., "best of 55 papers submitted")or send out the actual paper. But this info and more would be included. Simeon Schnapper of Youtopia (DML Badge Awardee and a badging platform) just went to a pretty high-powered meeting of visionaries led by famed inventor Ray Kurzweil. There are a bunch of opportunities for volunteers to contributed to the meeting (http://singularityvolunteers.org/) Simeon is well aware of how much more worthwhile those opportunities would be if they were acknowledge with a OBI badge. So if you volunteered to transcribe one of the presentations, the badge could easily link back to both the transcript and the video. Because the video features a renowned individual, that badge would be widely appreciated AND help draw attention to the event. How cool is that? F.L., on your second point about evaluating programs...OMG I am on a university wide committee and it turns out that evaluating academic programs, or even documenting what a program does, can be a real nightmare. Now that I am heading a small program I really understand why that is so. 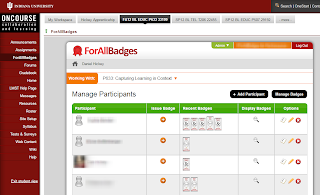 In the event that digital badges are fully embraced by an academic program, the database of information regarding each badge issued will serve as a really great record of what the program's activities. And if all of those badges were linked to student artifacts, someone could readily delve more deeply into program quality. Rather than getting a reportedly-representative sample of student papers somebody could just go into the database and sample at random. Of course many programs probably would not actually want that level of scrutiny. But if all program were doing it it would certainly be objective. 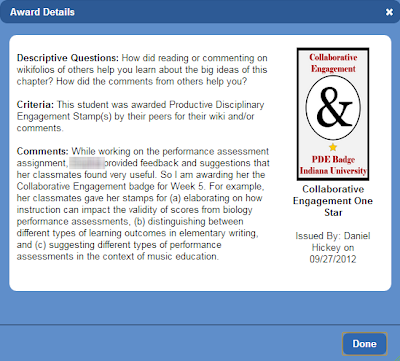 I do not know if I skipped something, but in your example, if I were one of your students - as I once was :) - how many "Productive Disciplinary Engagement" badges I would need to have to get a A+? Sorry Micheal I just saw this note. I have elected to not link badges to grades directly. That does not really help things out very much and really overlook that added function of badges. Badges should be much more valuable. We should flip the equation and say, "how many As do I need to get to earn this badge?